Despina Panayiotou Theodosiou is joint Managing Director of the Tototheo Group of Companies and has been with the group since 2005. Since 2013, Despina is a member of the Board of Directors of the Cyprus Shipping Chamber and is chairing the Chamber's Development and Promotion Committee since 2015. She also sits on the first Board of Governors of the Cyprus Maritime Academy and on the Board of Directors of the Cyprus-Germany Business Association. In 2011 Despina founded WISTA Cyprus - a member of WISTA International - and is the Association's current President. In 2015 during the International AGM in Turkey, Despina was elected Secretary of WISTA International. She won the titles of "Top Professional" and "Cyprus Business Woman of the Year 2015" at the 9th National Cyprus Business Woman of the Year Awards 2015. 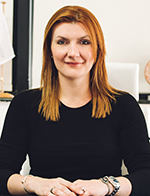 She holds a bachelor degree in Economics from the National and Capodistrian University of Athens and an Executive MBA in Shipping and Logistics from the Copenhagen Business School. She currently is a participant in the Postgraduate Diploma in Financial Strategy at the University of Oxford - Said Business School.